Leaf fishes live in a muddy, slow-moving water surrounded by leaves because their resemblance to a leaf enable them to hide themselves from predators. Their predators, as well as their prey, do not know they are there unless the predators touch them. Leaf fishes rarely move, and they are usually found near the shore. Leaf fishes have very large appetites. They eat in order for their body to maintain a normal shape. When they eat, the fishes eat very fast and widen their eyes. The leaf fishes eat anything that their mouth size allows, even each other. They eat large amounts of food in a day. Their anatomy resembles the sunfish. The fishes hardly move, and they usually keep their heads down. When the female and the male leaf fishes mate, they glide past each other on the surface and stay in that position for thirty minutes.Then,the male goes away so the female can lay her egg. The female lays her eggs either on or under the leaf's surface. Sometimes, she can produce eggs while lying upside down. Then, the male comes in to take care of the fry (baby leaf fishes) by surrounding them with bubbles. Three days later, the male digs a hole under the leaf in the 80 degrees Celcius temperature. On the fourth day, the fry begin to hatch. Two days later, the male teaches the fry to go hunt for food. The fry are fed on brine shrimp. Finally, when the fry mature, they do not recognize one another. 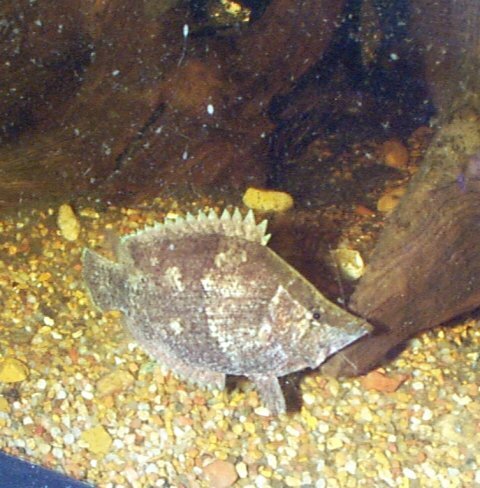 The leaf fishes live in acidic water and are potential breeders. If you want to keep the leaf fish as a "pet," then you have to change the water continuously once a week. 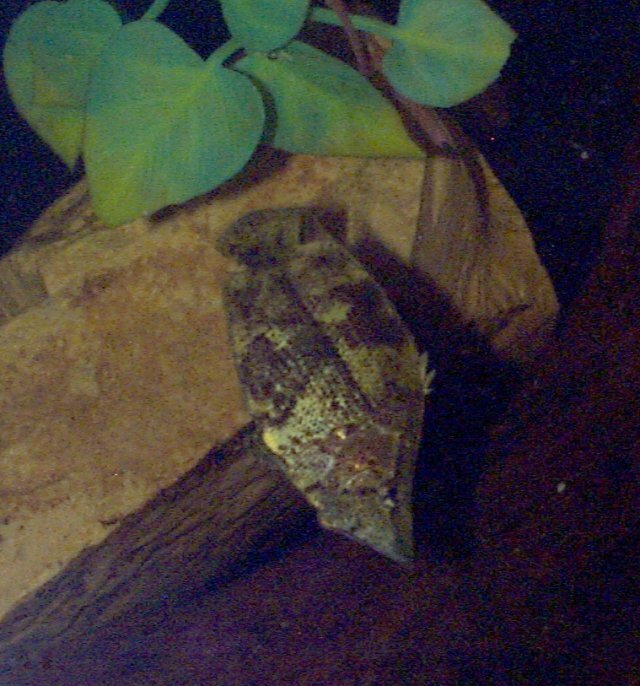 The Amazon Leaf Fishes found at the zoo were from a wild catch. They were very confident with their camouflage, so people could catch them very easily. They do not move. The fishes were found in muddy water in the Amazon River.When I visited, the aquarium biologist, Devin, told me he had just fed them with lots of fish food. When I went to the zoo to view the leaf fishes, I did not see any fish at first. I had to look very hard to find one. I thought the leaf fishes were pretty boring since they did not move at all and just stayed close to the leaves for a long time. When I went away to look at other fishes and returned, I found them at the same position, still swimming closely to the leaves. I also caught one leaf fish opening its mouth. Its mouth was very wide and resembled a balloon being filled with gas. 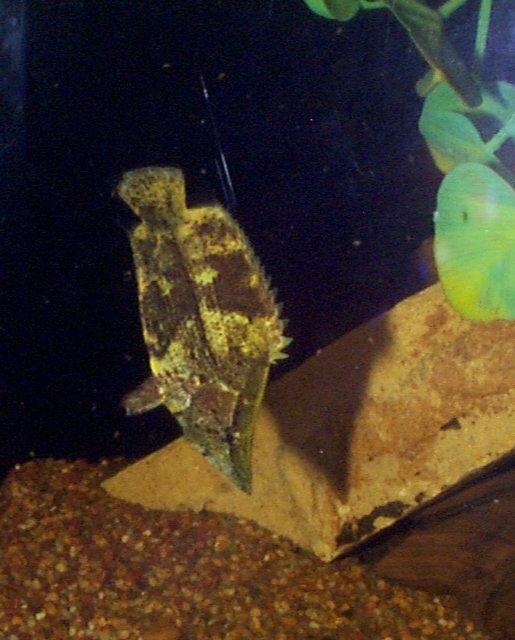 The most interesting characteristic about the leaf fish is its camouflage. It is very good in hiding itself in leaves. I did not know there were about five leaf fishes hiding themselves among the leaves until the aquarium biologist pointed them out to me. Axelrod, Herbert R. Brewing Aquarium Fishes. Book I. Neptune City, NJ: TFH, 1967. ---. Encyclopedia of Tropical Fishes. Neptune City, NF: TFH, 1986. York: Van Nostrand Beinhold Company, 1974. Hayes, Devin M., Forth Worth Zoo, Aquarium Biologist.
" Leaf Fish." Encyclopedia Britannica. online. 11 Nov.2000. Amazon," Tropical FIsh Hobbyist (1992):163-165.